Boot Camp: This high intensity 60 min workout will build strength and endurance through a variety of moderate to high impact moves. ZUU: The purpose of ZUU is to increase range of motion and decrease risk of injury through a series of body weight exercises. This half-hour class is designed like a circuit. Cycle: This indoor cycling class will begin with a standard 5-8 minute warm up focusing on technique and getting comfortable with the bike. The class will ride through a series of hills, sprints, jumps, and more. 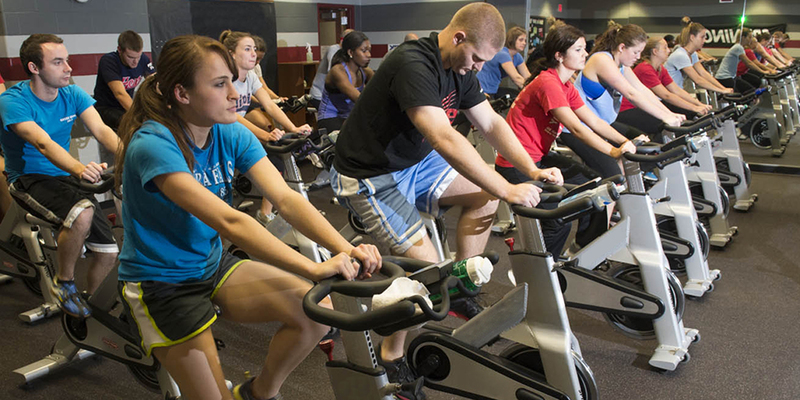 Cycle Circuit: This cycling class will run for roughly 30 min. Beginning with a standard 3-5 minute warmup and riding through a series of hills, sprints, jumps, and more. The other 30 min will be designated to plyometric exercises in Group Fitness B. Cycle Express: Cycle Express will run for roughly 30 min. Beginning with a standard 3-5 minute warmup and riding through a series of hills, sprints, jumps, and more. Cycle 45: This cycle class will run for roughly 45 min. Beginning with a standard 5-8 minute warmup and riding through a series of hills, sprints, jumps, and more. Cycle 60: Cycle 60 will run for a full hour. Beginning with a standard 5-8 minute warmup and riding through a series of hills, sprints, jumps, and more. World Dance: This dance class will focus on different styles each month. The first half of class will be focusing on technique and the last half will be choreographed dancing. Little to no dance experience required. Get ready for styles from Africa, the Caribbean, and right here in America. Zumba: Inspired by Latin dance and music, this fitness dance class offers a fun cardio workout through styles like cumbia, merengue, salsa, and more. Body Blast: This fast-paced class focuses on strengthening, toning and sculpting all areas of the body through circuits containing both strength and cardio moves. This class will use a variety of equipment as well as body weight exercises to train the entire body. Complete Core: Focus on your body’s core including the abdominals, glutes and low back. This workout will focus on progressive abdominal and lower back exercises to give you a strong and centered core as well as improve balance, posture and body alignment. Kettlebell: This class is a quick half-hour total body kettlebell training workout. Push yourself as you learn to use kettlebells for your upper and lower body. Total Arms & Abs: This strength class is a combination of body weight and free weight exercises designed to tone and strengthen arms and core muscles. This instructor will move participants through a sequenced order of exercises for a quick and efficient workout. Power Yoga: This form of yoga is meant to challenge the traditional vinyasa style. This style of yoga works to relax and strengthen the body through a series of fitness style movements. Restorative Yoga: The focus of Restorative Yoga is to slow down and open the body. In this class, the poses are held for longer durations and allows the muscles to relax deeply. Yoga: Yoga uses breathing techniques, exercise, and meditation to improve overall health and happiness. YogaFit: Designed to improve overall performance and health. 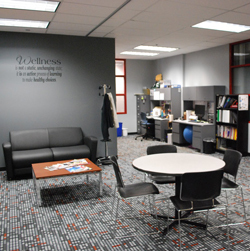 YogaFit incorporates more strength based movements that improve a participant’s level of fitness. Yoga Flow: Yoga Flow follows more of a Vinyasa style where it is almost like dancing. This class aims to improve flexibility and build strength.